With Jan's words from last season's fixture still echoing in our ears the South M5s were out to avenge that infamous JB-inflicted defeat. With a squad of eighteen plus Jo D installed as a potential 'spoiler' in the opposition goal the odds seemed to be heavily stacked in our favour this time. The home team got off to a great start, with substitutions working well and forwards and midfield creating some early chances. MoM Andy T came closest, latching onto a Rob B cross but deflecting it into the side netting. He was soon rewarded however when a Wilco D assist found him lurking on the far post, from where he was able to find the back of the net with typical Andy T 'coolness'. The home team continued to press hard but couldn't manage to extend their slim lead in the first half. Defensive reinforcements arrived at half time in the shape of Sean G who was immediately dispatched to the changing rooms to get ready for the second half. South continued to press for an equaliser but with Jo D stopping everything we sent his way (for which he almost secured a LoM!) the odds and time were against us. All in all, a closely fought game which the visitors deserved to win…and JB didn't score this time! Andy T was a worthy MoM winner with his deadly finishing skills, although he still managed to pick up a few LoM votes for his efforts. JB was the obvious LoM for failing to score, getting his backside in the way of a Rob B shot and various other misdemeanours! A very enjoyable game played in great spirits by both teams. Thank you, Newmarket! On a beautiful sunny morning, South’s L1s set off to pay a visit to Spalding for their last game of the season. This was a rearranged game from February that had been snowed off. The girls needed a convincing win to secure third place in the league ahead of Bourne Deeping. The South ladies started strong and continued the same way with some excellent play all across the pitch. It took some time for South to put something on the scoreboard but it finally came with a minute to go in the first half from a stunning pass from Amalia to Carly, who powered it into the back of the net. One-nil to South at half time. The second goal came from a flick by Captain Robs, awarded during a short corner (the gloves came off, btw). This was very shortly followed by a third off the back of Spalding’s pushback. The ball was recovered by Izzy who, after a few short passes, slotted it past the keeper. In our own twenty-three, Loopy made some excellent saves with some questionable body parts (“I saved that with my bum.”), Robyn had a near miss of her own creation by failing to notice a lurking Spalding player behind her but made up for it with a cracking save off the line. South’s final goal came from another good run by Izzy, who smashed the ball towards goal which was unfortunately (for the opposition) deflected by a Spalding player, right behind their own keeper. Despite only having one sub, South powered through til the final whistle with a clean sheet, leaving the pitch happy, sweaty and possibly a little sunburnt! The win means the L1s finish third in the 2NW division, the highest the team has ever reached. Well done, ladies! (Honorable mentions to Hannah for losing all sense of direction and passing the ball over the base line and Izzy for bowling over a lady twice her size). 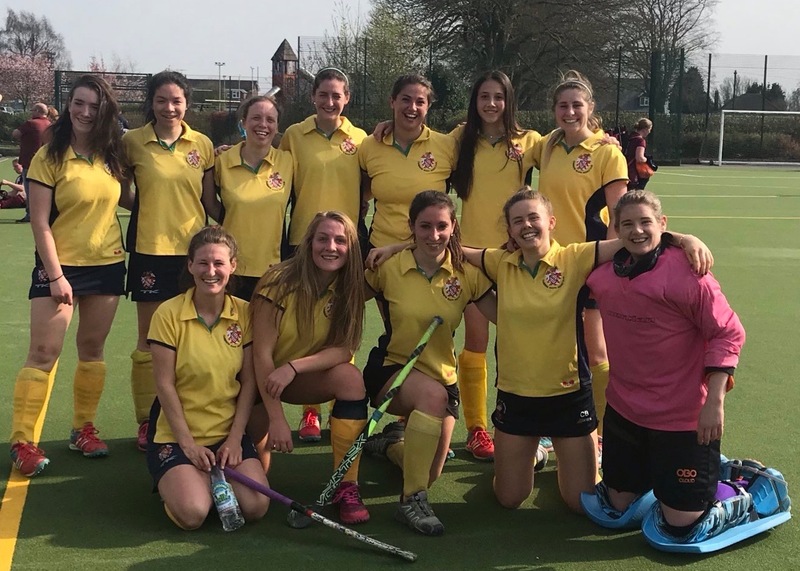 For the L5s’ final game of their debut season we were determined to get a win. With lots of energy, very supportive spectators (well equipped to watch hockey in the sun with pizza and chicken nuggets) and a full team, we were raring to go. The game got off to a good start with South working really well together as a team, some excellent passes being made, strong tackles and overall very good hockey. South's first goal came from a short corner with a brilliant injection. Iona took the strike from the top of D and the ball seemed to bypass all defenders except one, who assisted in knocking it into the goal. This boosted morale and left South even more eager to get another. The second goal came with a run down the wing from Jess, to Vicky, back to Jess, across to Bex and straight into the goal. A very impressive example of teamwork! Half time consisted of jelly babies and pizza (thanks to the M5s), for those who were feeling the effects of the night before, plenty of hydration, and a theory to make the ball do the work in the second half instead of us due to the heat. Letchworth came back strong in the second half, having a number of attempts at goals but our fantastic defence held strong and Cassie made from amazing saves in goal. Jess was determined to get a goal, so much so that her blinkers appeared to be on as she ran straight into the keeper, ending up on the floor. As the game to an end, with many slightly sunburnt but happy faces, we headed over for pizza. Thank you to Letchworth for giving us some very yummy Malteaser cake. MoM votes were very spread out showing the strength of the game, with votes going to Sammy, Bex, Lou, Katie, Kat, Cassie and with Nicole getting MoM this week for some excellent play. LoM votes went to Pauline (for a back stick that wasn’t a back stick), Zara (I again wasn’t playing so I’m not sure about this), with LoM going to Jess for her episode on the floor with the keeper.